Do you have a gap in your mouth due to a missing tooth? Does it make you self-conscious because others can see it when you smile? What if you could get it fixed? Wouldn’t that be a tremendous confidence booster? The teeth next to the missing tooth also have to be prepared for insertion of a bridge. Well you can! At Limestone City Dental, we may have the perfect solution for you in a fixed dental bridge. Give us a call and we’ll be happy to schedule an appointment for you so the doctor can take a look at that space and recommend treatment options. A dental bridge is made up of two crowns on either side of the missing tooth connected to an artificial tooth, called a pontic, in the middle. These three “teeth” form the “bridge” that is matched to the color of your teeth and then cemented into place to provide a permanent solution to your missing tooth dilemma! First, the doctor has to examine your mouth and the areas around the missing tooth to determine whether a dental bridge is appropriate for your situation. If you are a good candidate for a bridge, the teeth that are on either side of the missing tooth – the ones that will provide the “anchors” for the bridge – will be prepped for crowns. 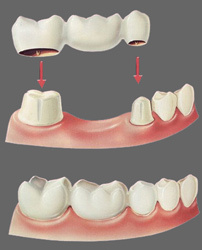 An impression is taken so that the bridge will fit exactly into the space and blend perfectly with your existing teeth. The first visit ends with the insertion of a temporary bridge to protect the area until the permanent bridge is ready. At your next and final visit, the permanent bridge is cemented into place and you’re all set! If you take care to practice good oral hygiene and maintain your proper dental cleaning and examination schedule, your new bridge should last for a good many years, providing you with a winning smile and a gigantic confidence boost! If you would like to explore dental bridges further, call our office to arrange a consultation or to receive more information.